Child abuse today is found more often than you would think. Every day a child dies from abuse or neglect in the home, and every day it goes unnoticed when a child needs help. When a report of child abuse is put into place DCFS has to step in and take the children away and they are then placed into foster care. Child abuse takes place in the home and more than likely comes from the parent/caregiver. It is a problem in today's society because it's rapidly growing and becoming an even bigger problem, so if more people are aware then it can be stopped. 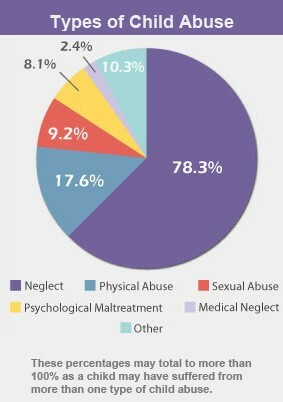 This is a pie chart that illustrates the types of child abuse found today and the percentage of children that receive it. This is a good example because most people when they think of child abuse just think of the physical kind, where as there are many different kinds of abuse a child could be dealing with. 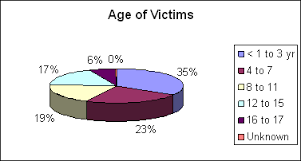 This pie chart is color coded to certain age groups that may receive child abuse. What you may notice is the age group that goes through it the most would be ages 1 to 3, they're only babies, they have no idea what's going on. Coming in a close second would be teenagers ages 16 to 17. This video shows what its like to be a child and to receive abuse, the fear of your own mother or father, not being able to go to them. It shows that abuse could lead to more problems later on in life as well. This video is a short film from the perspective of a little girl whose been put through abuse. It was made to spread awareness of what a child who deals with abuse goes through and how you can foster to give said kids a better life. This article/web page talks about what child abuse is and goes into detail about the different typed of child abuse. It also explains how to find help in case you are dealing with that abuse. This article/web page talks about what child abuse is and it addresses some myths about what child abuse is. It talks about how you can help a child being abused and how to recognize it, that it is not just physical, it can be emotional.